For the youngest this weekend, the proposal is to stay at the Migres Foundation headquarters to live a “Night of adventurers”. The activity is aimed at children from 7 to 12 years old. It starts at six o’clock on Friday afternoon and ends at eleven o’clock on Saturday morning. It is required to carry and sleeping bag, mat, pillow, picnic dinner and breakfast. The inscriptions are open in the CIMA. On the other hand, on Friday at the Casa de la Cultura from 19.30 there will be conferences. 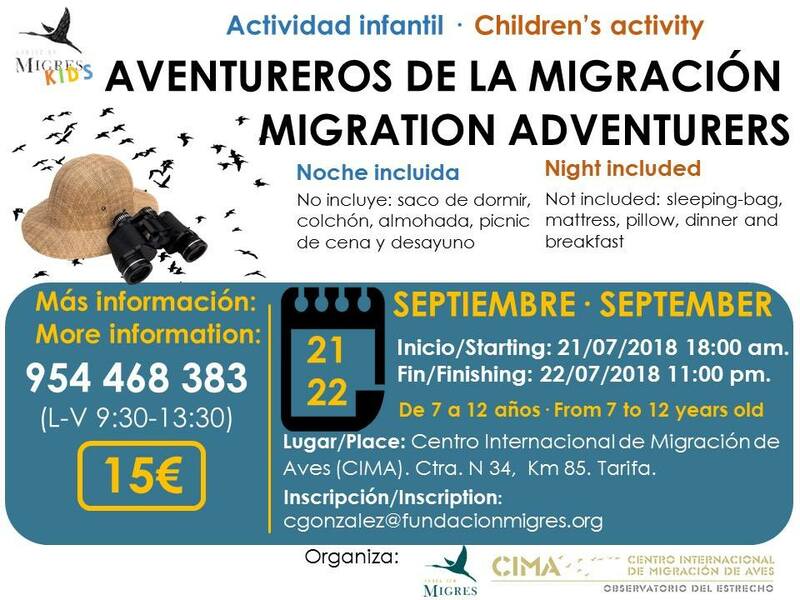 Photography and wild nature; monitoring and counting of marine mammals and birds from the Island of Tarifa and Ornithology in Tarifa; the 12 months are some of the themes proposed by collectives such as “Birding Tarifa” or Asociación Vida Silvestre. But also the story of the Tahivillense Paco “Recovero”, that is Francisco Jiménez Durán, pioneer of ornithological tourism in the area will be highlighted on Friday afternoon. We will also talk about the recovery project of patinegro plover. For Saturday, from 8 a.m. to 12 o’clock, Ornithological excursion to La Janda with Cádiz Birding is proposed, the meeting point is Observatorio Ornitológico Mirador de Cazalla. Also on Saturday, in Huerta Grande there will be a banding session for beginners. More information and registration at the Cazalla Observatory or at the Tourist Office of Paseo de la Alameda.